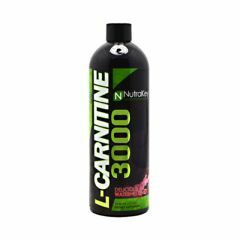 AllegroMedical.com presents The Nutrakey L-Carnitine 3000 - Delicious Watermelon Amino Acid Supplement. Essential in energy metabolism. May enhance cognition. Helps metabolize food into energy. May significantly reduce severity of depression symptoms. Significant improvements in exercise performance. Profound effects on endurance. L-Carnitine facilitates the metabolism of fatty acids for energy generation. A greater reliance on fat for energy can result in a sparing of muscle glycogen, an enhancement of exercise performance, and a reduction in stored body fat. L-Carnitine has a profound effect on endurance and exercise performance that works by reducing the respiratory exchange ratio and decreasing lactic acid accumulation in muscles. This results in extended exercise capacity before the onset of fatigue.